- This closeup of the early Republican helmet clearly shows the horsehair plume. The shield cover with wolf within wreath design is to the right. Part of the early Republican era scutum can be seen behind the helmet and shield cover. This closeup of the early Republican helmet clearly shows the horsehair plume. The shield cover with wolf within wreath design is to the right. 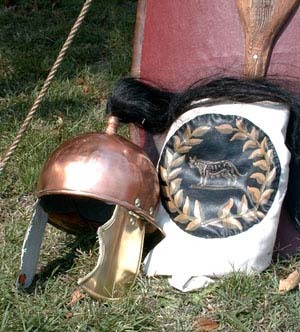 Part of the early Republican era scutum can be seen behind the helmet and shield cover.